SCOTTSDALE, Ariz. (AP) — For one pair of bald eagles, Scottsdale real estate is truly above par. The couple and their two 6-week-old hatchlings have been living in a massive nest above a golf course in the city, reported The Arizona Republic (http://bit.ly/1T4DT6k ). The eagles were likely attracted by the course’s lush greenery and fish-filled lake, said Kenneth Jacobson of the Game and Fish Department. He speculated that the birds may have been nesting along the Lower Salt and Verde rivers and needed more room to spread out. More bald eagles have been nesting in Arizona. Today, there are 59 breeding pairs, compared to 11 pairs in 1978. Last year was record-setting: 89 eggs were laid and 66 eaglets made their first flight. 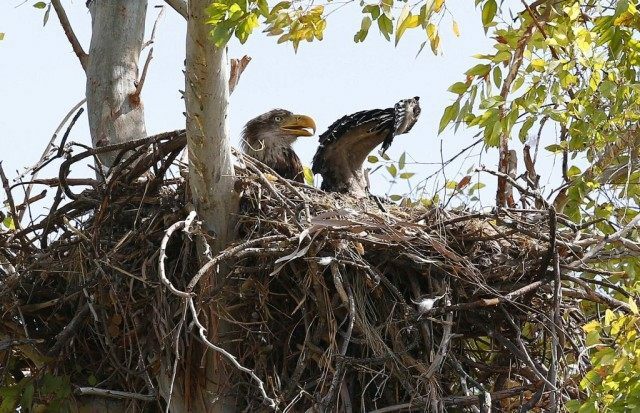 Bald eagles have been in the Scottsdale area for at least five years, according to Jacobson, but this is the first time they’ve nested there. He expects that the eaglets will be flying in another month. Bald eagle rehabilitation volunteer Joe Miller, who works with Liberty Wildlife in Scottsdale, has been giving Game and Fish regular reports on the eagles since the nest was built over the winter. “They’ve done a good job of picking out the tree inside the city where they are protected by a golf course fence and a larger outside fence. Plus, if you were to walk across the street, a big tree blocks (the nest) view,” said Miller, who watches the birds through a spotting scope. A sign on the course tells golfers not to disturb the eagle’s nest. The Republic didn’t publish the exact location of the golf course because the parents could abandon the nest if they are disturbed. It takes nine weeks for the eaglets to grow to full size and develop the white head and yellow beak of an adult. They are expected to leave the nest in late June, searching for cooler weather in the north. Arizona State University ornithologist David Pearson said seeing a bald eagle is a “goose bump” moment.